The classic DONIC competition table with a 25mm top. The table consists of 2 parts which are fixed by connecting components when being in playing position. Can be easily assembled. Delivery completely assembled except for the wheels. 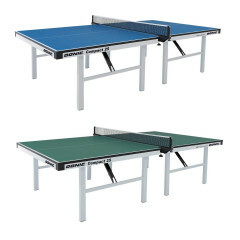 Donic Table Compact blue is beeing added to cart.